Has anyone ever made my blueberry banana oat bread? Highly unlikely as I posted that recipe way back when only my husband was reading this – maybe. He probably didn’t even read it, so back when I was the only one reading this! It’s a pretty fantastic quick bread though, so it needed to be brought back so a few people would actually see it. As muffins though, because muffins are fast and easy and you don’t need to have your oven on for an hour on a hot summer day to bake them. 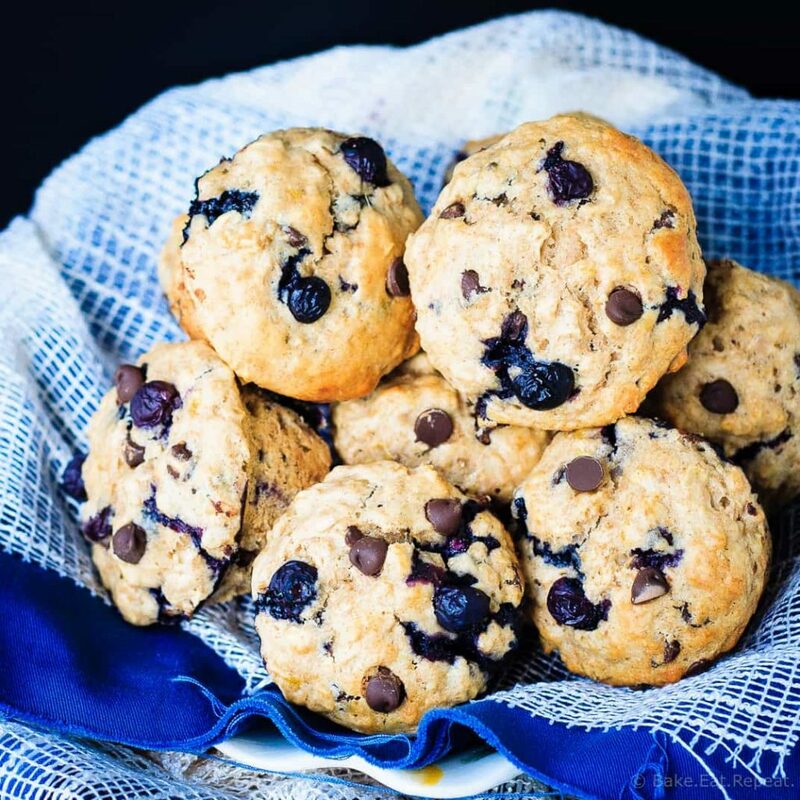 These banana blueberry muffins actually came about because a reader asked me if I thought that original quick bread recipe could be made into muffins. That seemed like such a fantastic idea to me that I immediately ran to the kitchen and made it as muffins. You know, for testing purposes. I couldn’t just guess at a baking time now could I? Well, actually, I suppose I could have since my guess turned out to be right. But still, quality control and all that. It needed to be tested. I’m so glad that I did, because these muffins were fantastic, and it had been far too long since I made that banana bread recipe anyways. Besides, you can never have too many healthy, delicious muffin recipes in your collection, right? No, just me? 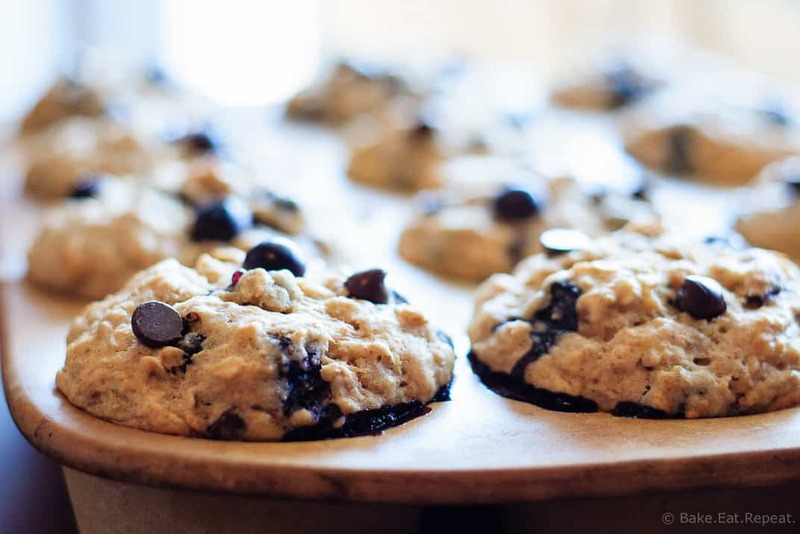 These banana blueberry muffins are soft and fluffy, and filled to bursting with blueberries, oats and chocolate chips (um, yes, I did need to put chocolate chips in – it’s okay they’re still pretty healthy!). You could certainly omit the chocolate and they’d still be amazing, I just have a hard time making muffins without chocolate chips, because, well, chocolate. But if you have more self control than me, feel free to omit them. I even wrote “optional” beside them in the ingredient list, even though I know it’s not optional in my house! Regardless of your chocolate preferences though, these muffins are delicious. Soft and fluffy and full of juicy summer blueberries. I may just have to go make some more. I’ve also shared this recipe over at Cupcakes and Kale Chips. Preheat the oven to 375 degrees F. Lightly spray a 12 cup muffin tin with cooking spray or line with paper liners and set aside. In a small bowl, mash the bananas well. Whisk in the buttermilk, eggs, brown sugar and oil until well combined. In a large bowl, toss together the whole wheat flour, all-purpose flour, rolled oats, baking powder, cinnamon, salt, baking soda. Pour in the wet ingredients and stir until just combined. Fold in the blueberries and chocolate chips (if using) gently. Divide the batter between the 12 prepared muffin cups, filling them almost to the top, and bake for 25-28 minutes, or until lightly browned and a toothpick inserted in the center comes out clean. Cool in the pan for 5-10 minutes, then remove to a wire rack to cool completely. b]Source:[/b] Slightly adapted from this [banana bread recipe . So glad you liked them Vicky! 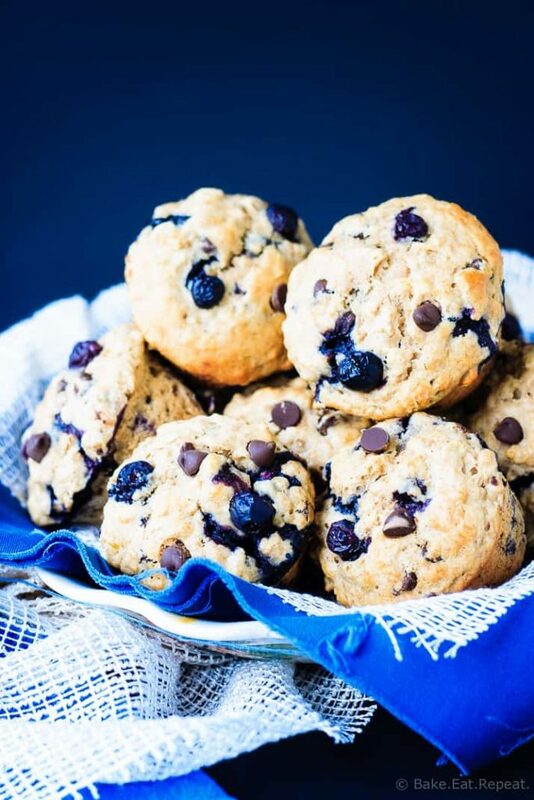 Heck yes, chocolate chips in the blueberry muffins FOR THE WIN!! 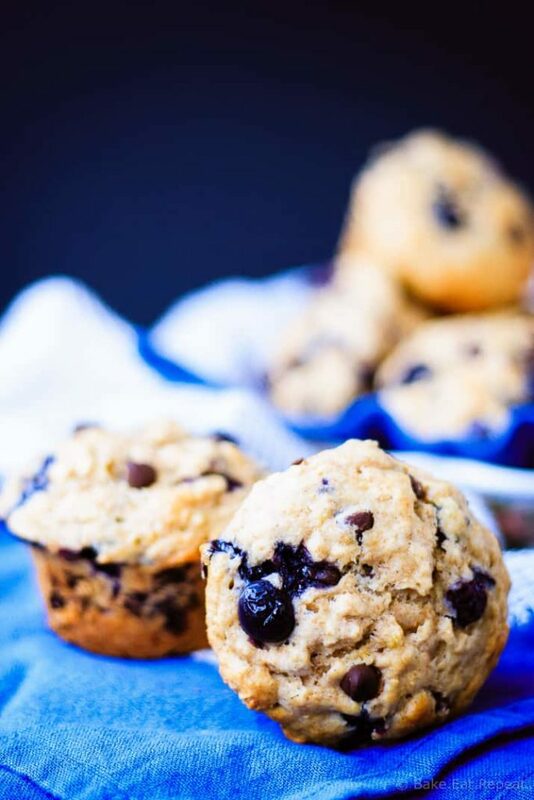 Chocolate chips are always a win in my opinion - but especially in a healthy muffin! :) Thanks Heather! These muffins look so delish! I love the chocolate blueberry combo! These look so yummy! I adore a good blueberry muffin and I love the chocolate chips in them as well. So must try these! Well, you really have to. Muffins and chocolate chips just belong together in my opinion! Thanks Erin! YUM! The bananas and blueberries are a great combo and the chocolate really takes these over the top! I can't wait to make them for my girls. A healthy muffin that still has chocolate chips? I am all in! Right?! Of course, they'd be healthier without the chocolate chips, but whatever! :) Thanks Chandra! Always up for healthy muffins Stacey! these look great! I am always up for a healthy and delicious muffin! These look fantastic! Love the blueberry, banana chocolate combo! You cannot possibly be thinking back to school already?! Summer just started, let's enjoy it first! :) Of course, muffins ARE perfect for back to school! Thanks Ashley! Bananas... blueberries .. AND chocolate chips! Yup.. officially my dream muffin! These look perfect! I love how many wonderful ingredients you packed in them! Everything I love is in these muffins! Love this healthy recipe. Heading over to snag it!